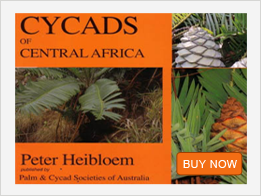 "I am one of the many very satisfied customers of Peter Heibloom of the Cycad Gardens of Eudlo. His collection of cycads is very impressive and I made my initial purchase of ungerminated seeds. After a couple of correspondences and seeing his list of seedlings and the incredibly cheaper price (compared to growers I visit in Thailand and the Philippines), I told myself that I have to visit his garden. I took the train from Brisbane and headed to Eudlo. Peter was kind enough to pick me up at the train station. His garden is much more impressive than the pictures on his website and I was like a kid in a candy store. The various cycads in his collection growing in Eudlo's sloping terrain were truly amazing and spectacular. He and his wife Clare even offered some home cooked soup (yummy) and bread while waiting for my purchase to be packed. I surely envy the collection Peter has! Peter is a very honest and reliable person to deal with and is very generous in giving me pointers on the growing and caring of the cycads. I ended up buying more than what I originally plan to get as some other varieties were unbelievably cheap. Peter was also generous in giving discounts (as I purchased a lot). My cycads are growing quite well in my garden in the Philippines. I hope I can visit his cycad paradise again."